Entity that came to dialigue: Master Ruanel. Interlocutor: What is Majestic 12? Ruanel: It is an organization with central headquarters in United States; It’s formed by seven important organizations and five not that important. Interlocutor: Was it called Majestic 12 because it is composed by 12 organizations? Ruanel: Correct. You can also add that each organization is composed by twelve members too. Interlocutor: But what kind of organization are they? Ruanel: They are organizations that contact with extraterrestrials. One of the organizations is in charge of Area 51. Interlocutor: Is it simply related to this place or it's directly the one that controls Area 51? Ruanel: It is the one that controls Area 51. Interlocutor: Who are the components of this organization? Ruanel: The so called "Men in Black." Interlocutor: Who is in charge? Ruanel: There is no person in charge, since they are many. Interlocutor: Where do these Men in Black come from? Ruanel: Most of the Men in black are former agents of the FBI and CIA. Some of them also come from other forces as the Navy. Interlocutor: Are they something like parallel organizations to the American government? Ruanel: Correct. The American government doesn’t know about many things because these parallel organizations hide many things. Interlocutor: Could one say that Majestic 12 controls the country? Ruanel: It controls the country at extraterrestrial level. In politics they don't interfere. Interlocutor: But, Do they have some influence in politics? Ruanel: Yes, They have influence, because there are many government employees, as senators, governors, etc. who are part of the organization. Ruanel: No, I simply want to jot down that there are many Men in black who are in combination with the Greys to threaten witnesses that have sighted ships. They have intimidated to some of them so that they don't speak, and to others they have made them look like crazy people or directly they have murdered them and made it look like a suicide. Interlocutor: Nothing to do, then, with that recent movie where the Men in Black fight against bad aliens? Ruanel: No, Not at all. Men In Black are in perfect combination with those negative aliens. Interlocutor: When was the branch of Men in Black created? Ruanel: It was created in 1947. Interlocutor: Since the Incident in Roswell? IS THE REPORT OF MILTON W. COOPER AUTHENTIC? Interlocutor: I am astonished by the speed in which you incorporated in the vessel!... Today I would like to dedicate the session to the famous topic of Majestic 12, especially to the report of Milton William Cooper whose writings left me many doubts. Ruanel: Yes, you can start with your questions. Interlocutor: Well, the first question that I have scheduled to ask is if it’s true that John F. Kennedy announced his intention of arriving to the Moon and everything was a farce, because there were terrestrial bases on the moon alreasy in which terrestrials and extraterrestrials were working. Ruanel: This is partially true. There was a combination with extraterrestrial you could call "Good Grays" I say that it is partially true because it was not totally a farce, since man didn't have the appropriate technology to go to the Moon yet. Interlocutor: This means that the bases that already existed on the Moon were made exclusively with extraterrestrial technology? Ruanel: That’s Correct. The terrestrials had been taken to the Moon by the space ships of these Good Grays. Interlocutor: Where were those establishments? Ruanel: Obviously on the hidden face of the Moon. I want to highlight the great mental decoder that Kennedy had here, besides a great power of observation, because months before that the threat of a nuclear planetary war exists, he managed to prevent it. Interlocutor: Are you talking about Nikita Khrushchev and the issue of the missiles in Cuba? Ruanel: Correct. In that opportunity he said a very important sentence: “Don't forget that we all breathe the same air." This is a sentence that many people have not yet interpreted in all its magnitude. Kennedy realized how limited, how small the planet Earth is, and at the smallest conflagration, at the smallest damage in the habitat, all the human beings would suffer. If a country is devastated atomically, the nuclear residuals could have an effect on the whole minuscule planet Earth. Then, when he says that grandiose sentence he is referring that it’s not a war between worlds, where if a world is annihilated, the other one stays undamaged, but rather it’s about the same planet, and what happens to a country also happens to all of them. This is the essence of the sentence that we all breathe the same air. Interlocutor: Which was the reason that Kennedy accepted to join to these aliens? Ruanel: Obviously due to the eagerness of knowing, of discovering new things. This avidity is a natural part of the idiosyncrasy of all the beings of the Creation. Interlocutor: And the reason for which he accepted the comedy, to call it somehow, of the project Columbia to go to the Moon when in fact they were already on it? Ruanel: That is due to his small or great Ego that impelled him to conquer the Moon using their own technological means and not someone else’s means. So much so that when he was incarnated he didn't allow that the artificial satellites use extraterrestrial technology. It was a very terrestrial pride the one that impelled him. Kennedy sustained that the aliens could collaborate with us, for example in the construction of facilities or in the development of technology, but not to replace us in those things that we should do by ourselves. According to these ideas, the recently created NASA began to develop in two places, in the center of United States and in Florida, the research with rockets to find the way to go to our natural satellite, competing both organizations to obtain devices with more accuracy and scope. Interlocutor: Did you say rockets? I ask it because it seemed to me strange that word. Ruanel: I said rockets because in that time they were called like that. Interlocutor: I understand. Where did those Good Greys come from? Ruanel: In fact there were two races of Good Grays, not one. Interlocutor: Are these two races still in Area 51? Ruanel: No, at the present moment they are not there. One of the races came from Spica. Contrary to other stellar systems, in Spica there are three inhabited planets. Ruanel: In most of the stellar systems there is- due to the proximity with the star- the possibility of two inhabited worlds. Three would be an exception. In the Solar System, for example, and I am only speaking of planets, not of satellites, there are only two worlds at the present time with possibility of life, Earth and Mars. Interlocutor: According to the data we have from you, Venus was also inhabited a long time ago. Interlocutor: And we also know that life exists in Ganymede. Ruanel: Not only Ganymede shelters life, but also Titan, Europe - in this satellite under its surface -, and in many other worlds. In some of them, there is also infinity of microorganisms. Interlocutor: How many worlds would have life in our Solar System, excluding those that only have microorganisms? Ruanel: There might be around eighteen worlds inhabited in the Solar System and with logical decoder. Interlocutor: I am very surprised. I believe that it is a topic to develop extensively in another session. Ruanel: Well. I continue. In other stellar systems there is also a possibility, due to the proximity to the star, of two inhabited worlds. Interlocutor: Of how many millions of kilometers are we speaking? I refer to the distance that each planet with possibility to develop life is from its star. We know, for example that our planet is at 150 millions of kilometers from the Sun, more or less. Ruanel: We are speaking of the worlds that are far from their stars 200 and 300 million kilometers. In Spica three possibilities exist: one of the worlds is at 180, another at 240 and the third at 360 million kilometers. One of the races of Good Grays is from Spica. In Spica as well as other stellar Systems, there are also negative races. In Orion the same thing happens. In Orion 3 there are warriors, in Orion 4 there are philosophers, etc. Not necessarily in a certain System all the beings are good. Interlocutor: Concretely, where the Good Grays that contacted with Kennedy come from? Ruanel: One of the races came from Spica 2 and the other from Aldebaran 4. Interlocutor: Are These Good Grays that contacted with the government of USA who warned them of the Negative Grays? I am referring to what Milton W Cooper says in his report. This person said that the Good Grays offered their help with the condition of a nuclear disarmament, and the American government refused their help. Ruanel: That negative response was due to an imminent nuclear conflict with the Soviet Union. Interlocutor: Then it was logical that they refused. Ruanel: The logical thing would have been that all the countries accept the nuclear disarmament. I will say something related to this topic we are speaking of. All the planets, in fact, should have atomic capacity or, like in other worlds, molecular disintegrator that here on Earth have not yet invented. Interlocutor: I don’t understand the point. Ruanel: I mean to the use of this technology for peaceful uses, for example to disintegrate meteors that might collide with the Earth and eventually cause disasters. Ruanel: What happens is that the human race has such a "intelligent" decoder - I say intelligent with quotation marks because in fact it is not real intelligence, but rather the intelligence of the machines - that translates well, but at the same time it is so reactive that this technology instead of being used for the construction of a better world it is used to destroy. Interlocutor: Did the Good Grays leave when the American government refused their help? Did they make a deal with the negative aliens then? Interlocutor: Cooper says in his report that the astronomers perceived objects that came closer to the planet and then they discovered that it was a very fleet of space ships that finally landed in the area of Ecuador. Ruanel: That fact is authentic. There were 51 ships. Interlocutor: Did they really sign some agreement? Ruanel: An agreement was signed and surprisingly there was a very specific number which was repetitive. The space ships were 51, the agreement, casually or accidentally had 51 pages, and later on there was a military base called as Area 51. Interlocutor: Too much coincidence Is it not? I suppose that it must have been chance. Ruanel: Yes, unless they have named it Area 51 for the 51 ships and for the 51 pages of the agreement. Interlocutor: I believe I understand the subtlety of what you say. Do you recognize the terms of the agreement? Ruanel: Most of the aliens are looking for carrying out what the same terrestrial would carry out, what we could call “altruistic projects for themselves", never for the others. Interlocutor: The irony of that concept is perfectly clear. Ruanel: In the same ways that the human being uses mice of guinea pigs, as well as the monkey rhesus or the chimpanzees to inoculate them virus with the purpose of developing a vaccine, the aliens make the same experiments with humans. But the human being is so basic that it’s as if the chimpanzee had a logical decoder and he told to the scientist: "Well, give me more bananas and I’ll allow you to experiment with me." The human being is so arrogant that his same arrogance blinds him. I refer, obviously, to spiritual blindness. And I say it because those exchanges will always be beneficial for the aliens, never for us, and in this way, irrationally; they allow to experiment with defenseless poor human beings, which is absurdly a conceited race. Interlocutor: Is it true the American government realized that the aliens had violated the pact and they were abducting more people than those they agreed to abduct and they were not returning them safe and sound and many disappeared permanently? My question has connection with the other aliens that also came to experiment with the human beings without requesting permission from anybody. Wouldn’t be that the Negative Grays who made the pact with the American government respected the agreement and the perverse abductions were made by other aliens that didn't have nothing to do with them? Definitely, what pact could be have made if at this time exist, according to what you said in the other session, there are 17 extraterrestrial races that abduct people and experiment awfully with them, like the case, for example, of the "Dead Women of Juarez"? Ruanel: I tell you now that the Negative Grays who signed the agreement didn't keep it. Interlocutor: And why did they sign it then? Ruanel: They signed it because in this way they could have in their power facilities where to experiment, and also, of course, the collaboration of the ingenuous terrestrials. Interlocutor: At this moment I’d like to ask you What is the more reproachable thing the terrestrial did in Area 51? Ruanel: They are not using the extraterrestrial technology to alleviate the hunger in the world. For example, the aliens have synthesizers of food. It is outrageous, in spite of the higher spiritual plane in which one is, seeing the reproachable behavior of some humans. As well as in the physical plane sedatives are injected endovenously to stimulate the production of endorphins and appease the pain, we appease ourselves with love, because if we don't, we would be so angry that we would even be in risk of lower of plane. Interlocutor: I understand. How does the synthesizer of food work? Ruanel: For example, you tell me which the component of certain food is: molecules of this, molecules of that, etc. there are synthesizers that can produce a vegetable meal similar to the original one. Interlocutor: Are you referring to cloning? Ruanel: It is not even cloning because the copy has the same components of the original, even with a difference in favor, which is it doesn’t have artificial elements chemical conservatives, no insecticides and no pollutants. It’s possible to make, for example, a piece of meat without killing an animal, directly cloning its components at a temperature of 73 grades, with juices, which i the blood of the meat, and even with the fat at its side. There are even synthesizers that can duplicate coffee, cocoa, etc. Interlocutor: Has this been developed here on Earth? Ruanel: No, no, and this is the outrageous thing, because in this way you could eradicate hunger on the planet. Interlocutor: I don’t understand why they have not made it. Ruanel: Simply because they are not interest in that. The only thing they are interested in is to have destructive devices. They are asking to the Grays permanently that they give them the “murderous laser”, ”molecular disintegrator” , all weapons to destroy. Interlocutor: It is really incredible such stupidity. What would it be a molecular disintegrator? Ruanel: It is a kind of a canyon that shoots anti-gravitational ions, it is something very difficult to understand - and it pulverizes all the rocks. If a human being were shot with this weapon he would be disintegrated completely. Interlocutor: Is it something like those disintegrators we see in some science fiction movies? Ruanel: It is similar. The hierarchs of Area 51 want the aliens to give them the technology to arm these murderous weapons, not the technology to alleviate the hunger in the world. Interlocutor: What you are saying is truly monstrous. Ruanel: And they are not interested because then the abusive trade of food would end. Interlocutor: All of this is clear and I repeat that it’s truly monstrous. I don’t want to think where these indifferent people will end when they disembody. 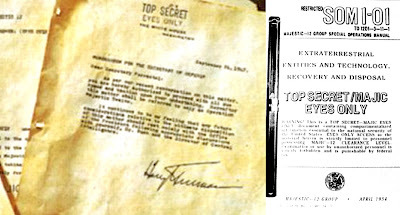 Moving on to another question, but always related to the topic, the report of Milton W. Cooper says that behind Kennedy's murder was the Majestic 12, and it was because of the president was going to make public the existence of aliens and he was also going to denounce that this organization was trading with drugs in order to collect money for Area 51. Of course we know that the true plotters were the spirits of Error, but I mean besides of them. Ruanel: What Cooper says it’s absolutely true. Kennedy's murder, in fact, didn't have a single reason but several. First he wanted to let people know what you say. Kennedy was kind of a dreamer or rather a lyrical person. He was a romantic person who wanted the best thing for the planet. He wouldn’t have allowed the things that other presidents allowed. I am not saying that as a human being he was perfect by no means, because he had his secret affairs, he was accomplice of many conspiracies and the intellectual author of many murders. But he justified himself saying: "If I open a body to extirpate a cancer, the wound I cause is justified." That is to say, the deaths he ordered had that base, according to his justification in that moment; they were for his own government's benefit. Interlocutor: Needless to say that the one who was justifying was Kennedy's 10%, not his Thetan. Interlocutor: Did Kennedy visit Area 51? Ruanel: Kennedy knew everything. He was one of the few presidents who were aware of everything that happened there. The other presidents, even the current president, were only puppets. Interlocutor: Was his brother Bob also aware of that? Ruanel: Yes, absolutely. And there were many people of his family who knew more than they should and they were eliminated by the Men in black. Interlocutor: Did Marilyn Monroe know about the existence of the aliens and Area 51? Ruanel: Yes, she knew, because in the bedroom Kennedy talked to her permanently about it. Interlocutor: Was her murder also due to this issue? I mean if she was going to reveal the existence of extraterrestrials. Ruanel: No, because she was in another things. Marilyn had such a big Ego that the only thing she wanted was to be loved. Notice that she was one of the most beautiful women on the planet; nonetheless she had a gigantic complex of inferiority because she had failed romantically with all her lovers. Interlocutor: Another point is clear. Milton W. Cooper died of cancer? Was it provoked to him? With so many plots one suspects of everything. Ruanel: No, it was not provoked to him, it was his own illness. Interlocutor: In his report, Cooper speaks of an astonishing number of space ships that crashed. Is there some special reason for that? Ruanel: I will explain it in the most simple way. There are four places in the planet to which UFOS go when they enter into the terrestrial orbit: The center of United States, Siberia, Australia and the center of Argentina. There are the so called Nadis, magnetic Nadis. As most of the space ships are anti-gravitational - they don't use atomic motors or something like that, but rather they are propelled by anti-gravitational impulses – then, it is easier for them to travel through these Nadis. Sometimes, some of these Nadis are, so to speak, in short circuit and the ship when lacking support automatically falls. Interlocutor: Is it something like as if a gigantic Jumbo entered in a well of air and the pilot could not control it and then it falls to the ground? Ruanel: Yes, it is something similar. I repeat, then, so that there is no doubt. Nadis are parallel and energetic meridians that each planet has. Well. In the junction of the Nadis, where there is greater sustainability, there are what we could call "freeways" or rather "airways" These aerial paths are found in the center of The United States, Siberia, Australia and the center of Argentina, in this last country they are found precisely in the county of Cordoba. Sometimes, those Nadis are not well shaped and they can have “empty spaces” - there is no word in the language of the physical plane with which the decoder of this vessel could translate my idea - and these empty spaces can have two or three kilometers. Although these distances are not long compared to the size of the planet, for a space ship they are enormous. When the ship enters into this empty space, the same thing happens comparing to the Jumbo of your example, it loses sustainability and it falls at full speed to the ground. Many ships have been wrecked in Siberia, most of them have been hidden by the Russian government and others have not been found since they have fallen on the steppes covered with snow. In the Australian desert there are at least twelve or fourteen wrecked ships. And in Cordoba, near Uritorco, there are around three or four. Interlocutor: As far as I know they have not been found. Ruanel: Of course not. Some of the UFOS have been recovered by the same aliens. From the ship itself, first they pulverize the remains with a molecular disintegrator, and later on, with a special device they extract it so that there is no trace. Interlocutor: This is clear. Another question that I have scheduled it is related to the truthfulness in which Cooper is saying that there are bases in Mars with human personnel, who were taken by the aliens of Area 51. What is the truth about this? Ruanel: There are no Terrestrial bases, but it is true that some people have been taken to the red planet. Interlocutor: Did they simply take them to sightsee there? Ruanel: Correct, but I repeat that there are no bases there. As a simple anecdote, and now that we are speaking about it, I inform you that an extraterrestrial civilization, that is to say, non Martian, built in Mars 49 monoliths in a certain geographical alignment. Notice that if you show to a terrestrial a picture of an alien greeting him, the first thing he will say would be "It’s a trick." You can even show them a film in which you are hugging an alien and they will always say that it is a trick. Interlocutor: It is true what you always say, and I constantly confirm that foolish skepticism in people I speak about the matter. Do they know in Area 51 that the Martians exist? Ruanel: Of course they know! How would they ignore something so evident? To Area 51 Mars is just around the corner. And they also know that they inhabit in big caves and that they will be transferred to another planet soon. Interlocutor: But then the scientists of NASA are imbecile? Ruanel: Basically, they want to do the same thing Kennedy did with the Moon, that is to say, to go to Mars with terrestrial technology, not extraterrestrial. That is not bad, because it is good that each planet develops its own research. Interlocutor: And NASA knows that Mars is inhabited? Ruanel: No, NASA doesn't know it; those who know are in Area 51. Interlocutor: Are the guys of Area 51 doing things so well that even the people of NASA don’t know that there are extraterrestrials right in their own faces? Ruanel: They don’t need to do things well, as you say, since they are taking advantage of the terrestrial imbecility. Amateur observers see space ships every day and officially NASA doesn’t believe in extraterrestrials! Interlocutor: What you are telling me is the height of imbecility. Ruanel: Besides, Carl Sagan himself said that the possibility of inhabited worlds was real. Interlocutor: Did Carl Sagan know about Area 51? Ruanel: In the last years of his life, he did. Interlocutor: As far as I know, he never spoke about it. Was he threatened by the Men in black so that he didn’t speak? Ruanel: No, he was not interested so much in life so that somebody could threaten him. Besides, he was such a big important figure that if they had threatened him, he woud have automatically denounced it and his accusation would have appeared in all the newspapers. Interlocutor: It’s strange to me that having that kind of power he didn’t say anything. Ruanel: Well, he knew about Area 51 in the last years of his life, he was already elder, and he didn't want to have any problem. Interlocutor: Is it true that he was a detractor of the possibility of extraterrestrial existence on Earth? Ruanel: Yes, during most of his life he was. In the last two years before disembodying he knew the truth. Interlocutor: I understand. Was James Forrestal really murdered by the men in black as Cooper says? Ruanel: Yes, the fact is true. Interlocutor: Was Russia aware of Area 51? Ruanel: Yes, I confirm it to you. Russia was not only aware, but they even had a special laboratory where Russian scientists worked alongside with the same Grays that made a pact with the United States. Interlocutor: Does this continue at the present time? Ruanel: No, not at the present time. Interlocutor: That is to say, summarizing, at this time there are no extraterrestrials in Russia working with Russian scientists? Ruanel: Correct. Russia has dismantled its laboratories because they don't have the economic power to sustain them. Interlocutor: How long Were the extraterrestrial bases in Russia? Ruanel: Approximately twenty years, from 1969 to 1989. Starting from 1989 they began to decay. If you could see the Russian depots of atomic bombs you would find spider webs everywhere. Interlocutor: I can hardly believe in such decadence of a nation that competed with The United States for the supremacy of the space. And how do the United States get the funds to maintain Area 51? Ruanel: There are many American senators that are in combination with the Cartel of Medellin, in Colombia, and also with those in Ecuador, Mexico and other places, and they give the approval for the drug traffic, especially opening the borders so that they pass the drugs. 40% of the money obtained in this way is used to finance Area 51. Interlocutor: Is the president Bush aware of this? Ruanel: No, he ignores it completely. Interlocutor: Is it valid, then, what Cooper says in his report that the president Kennedy was going to object this and it was one of the reasons he was murdered? Ruanel: Yes, the fact is truthful. Interlocutor: Well another point is clear. Now I’d like to move on to the topic of the Moon. Concretely, at this moment, Are there bases of terrestrial and extraterrestrial in our satellite? I mean if they are in the Moon together. Ruanel: On the hidden face of the Moon there are small bases, but they are extraterrestrial bases, not terrestrial. The terrestrial people of Area 51 can go whenever they want, but the bases, I repeat, are not terrestrial. Interlocutor: Do those bases belong to the aliens that made a pact with The United States and are in Area 51? Interlocutor: Aren’t there other extraterrestrial bases on the Moon from other races? Ruanel: In the past there were bases, but not at the present time. Interlocutor: Is there some reason for that? Ruanel: What happens is that those Gray aliens took control, so to speak, of the satellite and they don't allow another bases to exist. At this moment, I want to extend a topic that was unconcluded: the spacecraft Mars Observer sent seven thousand pictures of the planet Mars and in several of them, 49 monoliths appear aligned geographically and they are artificial. These pictures can be found on the web. Ruanel: The builders were the aliens from Orion 3. Interlocutor: What did NASA do with these pictures? Ruanel: They simply put them aside. They didn't attach importance to it. One of the two, either they are cretin or their decoder is in short circuit. Any person, any amateur observer, with some common sense would realize that in a planet where supposedly there is no life, if 49 monoliths appear geographically aligned, something like that would be demonstrating obviously the opposite. To deny it would be as absurd as if I said that in a certain forest the trees grow naturally with the top well pruned. The scientists of NASA are kindergarten kids! Interlocutor: Were those pictures taken by chance by the Mars Observer or the Martians send them to the scientist as a joke? Ruanel: Those pictures were taken by the robot simply by chance. Among the seven thousand pictures the robot took, the monoliths appeared. Interlocutor: moving on with the topic of the Moon, what is there in it? Are there lakes, vegetation, as Cooper says? Ruanel: No, that is not exact. The atmosphere of the Moon is not enough for water to exist and even less vegetation. Therefore, it is a dead satellite in the sense that there are no volcanos, earthquakes, or tectonic plates... On the other hand, In Io, one of the satellites of Jupiter has even more intense earthquakes than Earth. Interlocutor: The terrestrials from Area 51 were taken, besides to Mars and the Moon, to other planets? Ruanel: Yes, they were taken to some satellites of Jupiter and of Saturn. Interlocutor: Are we speaking of bases or simply sightseeing? Ruanel: They went only on tourism. They have taken pictures and they have even filmed. Interlocutor: Do these documents still exist? Ruanel: Yes, but they are perfectly safe in Area 51. I presume that finally they will come to the light. There might be People whose greediness will be bigger than fear and escape with them to make them known. Interlocutor: According to Cooper there were payments to the Kennedy family that were very secret, but they are unknown. Ruanel: Those payments were for the president's death. The family considered them as a compensation, but the truth is that it was a pretext from those that ordered his murder to wash their blames somehow. Interlocutor: Was Kissinger aware of Area 51? Interlocutor: Did some church influence so that the existence of extraterrestrial and the same Area 51 were hidden? I ask it because Cooper said that the reason for which they decided to hide the existence of aliens was because, it could make collapse the economy and provoke the destruction of religions, because this information would reveal that all religions were false. Ruanel: The excuse of the concealment is true, but there was no intervention of any church. Churches were left out of all that. Interlocutor: Another of the things that Cooper said is that the extraterrestrials showed a holographic image of the crucifixion of Jesus and that holographic image was even filmed. The aliens, who were showing that image, said that they could travel through time. Ruanel: It is true, They can travel through time. If the terrestrials achieved time travels in the year 2500, How could the aliens not achieve that, if they have more time of evolution? However, the holographic image of the crucifixion of Jesus was not real. It was displayed by the negative Grays in order to deceive humans and manipulate them. Interlocutor: When the astronauts arrived for the first time to the Moon, Did they already know that bases existed on the Moon? I ask it because it has leaked out that they saw those bases from the ship. Ruanel: No, they didn't know anything and they were completely surprised. This surprise was revealed in the conversations they had, when they commented what they saw. They even listened to the voices that came from those bases and they also recorded them. But these recordings were obliterated by NASA soon after. Interlocutor: Is it true that NASA retransmitted the recording of the trip with some minutes of difference? Concretely, I am asking if the transmission was on-line. Ruanel: No, the transmission was not direct. But the difference didn't exceed three minutes. In spite of the so small time, It was enough to the scientists of NASA to erase what they didn't want to be seen or heard. Interlocutor: Obviously, the astronauts were silenced. Interlocutor: Were they threatened with death? Ruanel: No directly. They appealed to their sense of patriotism. In The United States the patriotism is very severe and the crime of betrayal crime to the homeland is punished with shooting. Interlocutor: The point was clarified perfectly. Was there a ship called Aurora? Cooper says that it was used to travel to other planets. Ruanel: The information is erroneous related to the travels to other planets, because it is a ship that doesn't have the necessary technology for it. Interlocutor: Cooper says that Hitler was manipulated by extraterrestrials. I know that it was he was abducted by extraterrestrial before being captured by the allies, but I don't have the piece of information if he was manipulated. Ruanel: Hitler was manipulated by extraterrestrials, but he was manipulated more by the spirits of Error. Interlocutor: I understand. Did the aliens who survived the accident in Roswell really collaborate with the personnel in Area 51 as Cooper says? Ruanel: Yes, because they have no other choice. Ruanel: In the place that this person mentions there are similar extraterrestrial beings to those in Area 51. Interlocutor: Dependent or independent from Area 51? Ruanel: They are independent but they are in touch. Ruanel: Yes, they are Gray. And they have disintegrator devices that somehow can deviate the atmospheric phenomena. Interlocutor: Are they good Grays or Bad Grays? Ruanel: They are Bad Grays. Interlocutor: Do they have some connection with The Dead Women of Juarez? Interlocutor: Don’t they abduct people? Ruanel: No, they don’t make that kind of experiments. Ruanel: No they don’t do that either. Interlocutor: What kind of technology they have? Ruanel: The same technology that the alien of Area 51 have. Interlocutor: How long have they been there? Ruanel: They are since the year 1998. Interlocutor: Do they work with Korean workers? Ruanel: They use them as a front, but some of them work for a secret service of information. Interlocutor: Of the Mexican government? Ruanel: No, not the Mexican government, but of Area 51. Interlocutor: Is the base located in the Mexican coast? Interlocutor: Concretely, what this consultant says is real. Ruanel: Yes, completely. I leave now because the vessel has low pressure. I leave all my light to you. Milton William Cooper was killed in a confrontation with the Apache county sheriff's office, he may have had cancer and he didn't know it or he didn't mention it. This entry was posted at Thursday, June 04, 2009 and is filed under Area 51 . You can follow any responses to this entry through the .